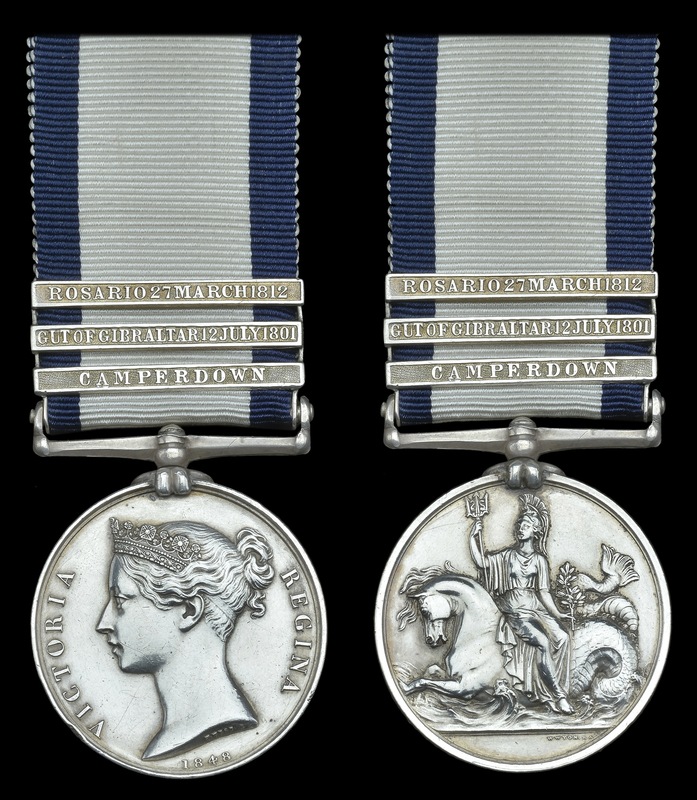 In a previous blog I wrote about the British Naval General Service Medal 1793-1840 (NGS) awarded to the most common type of vessel in the Royal Navy during the Napoleonic wars, the Cruizer-class brig-sloop of 18 guns. Medals to these smaller vessels have always fascinated me, as one can be certain that every hand onboard was engaged in action, making these medals particularly hard earned. 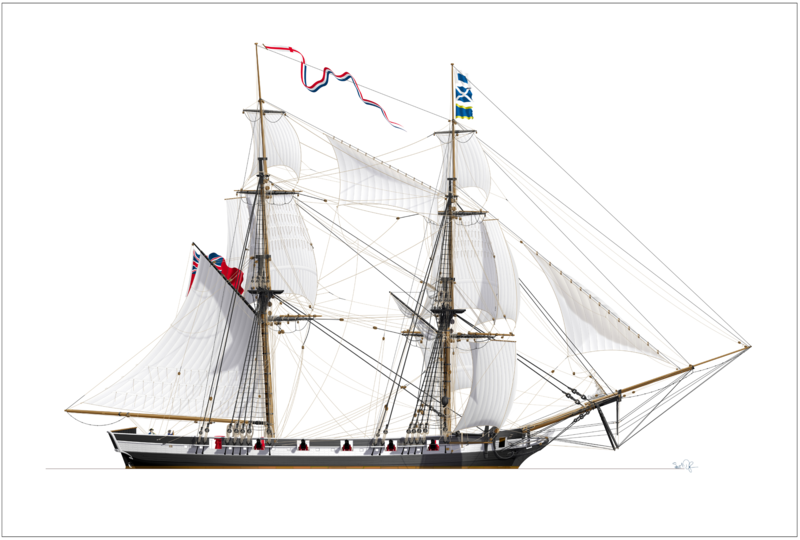 In this blog post I will deal with Cherokee-class of brig-sloops, equipped with 10 guns. With about ~110 built, this class of vessel would continue to be built well into the 1830s and would eventually outnumber the Cruizers. The most famous of the Cherokee-class ships is undoubtedly HMS Beagle, in which the naturalist Charles Darwin made his famous voyage, 1831-1836; however, Beagle was not launched until 1820 and was subsequently heavily modified before it undertook its epic exploration cruises. In medallic context we are concerned with the Napoleonic period, so this fascinating story will not be told here. The Cherokee-class vessels were designed by the Surveyor of the Navy, Sir Henry Peake in 1807. They were flush-decked, meaning no quarterdeck or forecastle, being slightly small than the Cruizers, with a length of 90 ft and beam width of ~25 ft, drawing 12 ft of water at the bow (compared to ~100 ft length and ~30 ft beam width, and ~15 ft of draw at the bow for the Cruizers). Like the Cruizer-class, the officer in charge was a Commander RN, with normally a couple of junior Lieutenants RN assisting. In addition, the usual standing officers, two Midshipmen, and the ratings would make up a crew of ~75 men. It was armed with 8 × 18 pdr carronades and 2 × 6 pdr guns in the bow. The 10 gun brig-sloop HMS Cherokee. Drawing © by Sean Douglas. …surprising indeed that the Navy Board would continue adding new individuals by dozens at a time to this worthless class. …she has proved herself, under every possible variety of trial, in all kinds of weather, an excellent sea boat. However, the class was rarely used for actual enemy reconnaissance, being too weakly armed to effectively deal with its heavy frigates. It did see use in attacks on enemy commerce and small privateers as is evident from the table below. Naval General Service Medal 1793-1840, awarded to Lieut. Joseph Richard Raggett WEBB, R.N. Click name to see O’Byrne’s biographical entry. Image courtesy of DNW. As mentioned in my previous blog, in the recent Goddard sale at DNW, it was remarkable to see two examples of NGS medals, both bearing the namesake for their respective classes, the Cruizer-class (lot 16) and Cherokee-class (lot 42). As can be seen in the table below, the namesake Cherokee medal is one of only 4 issued. This example is issued to Lieut. Joseph Webb. Another example issued to Supernumerary Pilot, Henry Baker is in the National Maritime Museum. The other two examples have never been recorded. Unsurprisingly, Webb’s medal fetched £28,000, having previously been sold at Spink in July 2000 as part of the Ron Byatt collection. At that time, I remember the room was astonished, when it hammered at £19,000, which was then a record breaking price for an NGS medal. Cherokee-class brig-sloops which qualified for an NGS clasp. Numbers in brackets indicate total number of medals issued. Red lettering indicates the NGS clasp was named after the vessel. The action off Dieppe harbor, which won HMS Cherokee its NGS clasp is well described in the DNW writeup. The only other information I can add, relates to the mention of an unknown Lieutenant being wounded. According to James[1: Vol. 5] – this was not Webb, but rather Lieut. Vere Gabriel, RN, who must have been the other Lieutenant onboard. As can be seen from the table, with four separate clasps named after the vessel itself, the Cherokee brig-sloops did not qualify for as many of these named NGS clasps as the Cruizers, which tallied 12 named clasps. However, a total of 12 Cherokee-class ships earned NGS clasps, with two ships earning two clasps each. All of the named Cherokee-class NGS clasps clearly belong in the extremely rare category, with only (4+2+5+7 = 18) issued in total. This is consistent with these vessels being smaller ships with comparatively smaller crew, and consequently fewer surviving potential applicants for the NGS medal. However, the survival rate appears to be in line with that found for larger ships-of-the-line in single-ship or double-ship actions at the same time. For example, the NGS claimant rate for HMS Centaur (74 guns) for the clasp CENTAUR 26 AUG 1808 is ~6% with 42 issued clasps, for a complement of ~600 men. This compares well with the average rates for the Cherokee-class clasps (complement of ~75 men, with ~6% being 4-5 claimants). Of the medals to HMS Briseis, only one is known, this being issued to Lieut. George Welsh (having both the Boat Service and named clasp in addition to COPENHAGEN 1801). This medal sold at Glendining’s in June 1925 for £16. The medals to HMS Onyx, appear have a better survival rate. With one being in the National Maritime Museum (Henry Edwards, Quarter Gunner). One medal named to Hewson Dutchman, Clerk, was for sale at Baldwins in Nov 2001. 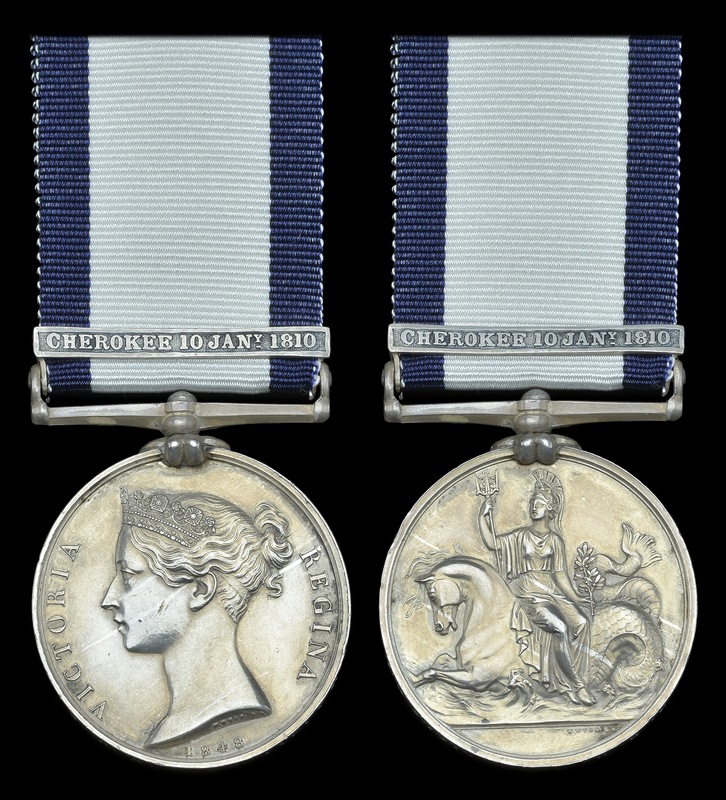 I viewed this medal, but was not happy with the naming, and the diameter of the medals seemed too small at 35.9mm, I believe the medal was subsequently withdrawn from the sale. Probably the most attractive of the five issued Onyx medals surfaced in 2005, it being the medal to Lieut. Edward Garrett who was promoted for the action, this came directly from the family. The medal also had the TRAFALGAR clasp (HMS Mars). I inspected this wonderful medal, which had only surfaced a few days before Bonham’s ‘Bi-centenerary Trafalgar’ sale on 18 Oct 2005, and was consequently not cataloged at all. I had hoped to add it to the collection – this one “flying under-the-radar” etc., but unfortunately, I was severely outbid when it sold at a staggering £34,800. NGS 1793-1840 medal to Gunner John Webber with ROSARIO 27 MARCH 1812 clasp. Image courtesy of DNW. Of the seven medals to HMS Rosario, six are known – with four being in museums. John Goddard, with his discerning eye, had however managed to acquire one of the still available examples for his collection, the three-clasper to Gunner John Webber (CAMPERDOWN and GUT OF GIBRALTAR 12 JULY 1801 also on the medal). This medal was ex. Gowans collection and was purchased by Mr. Goddard at the Spink sale, 15 Nov 1985, for £2,800. It hammered at the DNW (24 Nov 2015) for £22,000. If the reader is wondering where all these provenance notes come from, I need to draw attention to the excellent list of extant/spotted NGS medals maintained by Jim Murray for many years. We’re lucky to have been able to add this valuable list to the OMSA website, as a fully searchable database. The provenance of these and other known NGS medals can now be checked at our online data bases here. In future blog posts I will deal with NGS medals to the most famous cruisers of the Royal Navy, the Frigates. William James, The naval history of Great Britain from the declaration of war by France in February 1793 to the accession of George IV in January 1820 : with an account of the origin and progressive increase of the British Navy …. Five volumes (London Baldwin, Cradock & Joy, 1822–24. Available online here. Brian Lavery, Nelson’s Navy, Conway Maritime Press, 1989. Rif Winfield, British Warships in the Age of Sail, 1793-1817. Seaforth Publishing, 2008. 1. The information regarding these (2) smaller class of ships adds much to my knowledge regarding the Royal Navy’s ship building strategy and how this relates to collecting the Naval General Service (NGS) Medals. 2. I can better appreciate John Goddard’s discerning eye in compiling his magnificent collection of NGS Medals. 3. Excellent examples on how digital databases, such as the NGS Extant Medal Roll compiled by Jim Murray located on the OMSA Website, can help the collector find that hidden gem. Thanks Chris, Yes – sometimes one gleans new fascinating aspects and information about these medals when one looks at it from a slightly different angle, as in this case, the classes of ships and how they were used. And yes, the Goddard collection was in my view the finest NGS collection coming up for public sale since 1927. The databases help enormously with provenance, Jim Murray has done a fantastic job with keeping them up to date. Peter my compliments on a wonderful article. Very informative and beautifully written. I have always admired British medals and love learning more about them and their history. I found your article fascinating and learned a great deal. Thank you for your time effort and expertise. Thank you Rick, much appreciated. Very pleased you liked it, I try to sometimes take a slightly different view on the British naval medals, like trying to understand rarity and “hardship” in qualifying for the men. The two blogs on Cruizer and Cherokee-class sloops exemplifies this I hope. I will try to write more about the ‘Boat Service’ clasps to the NGS medal in a future blog, these were very hard earned as well. And also – thank you very much for your own efforts, I’ve leaned a bunch, keep it coming!